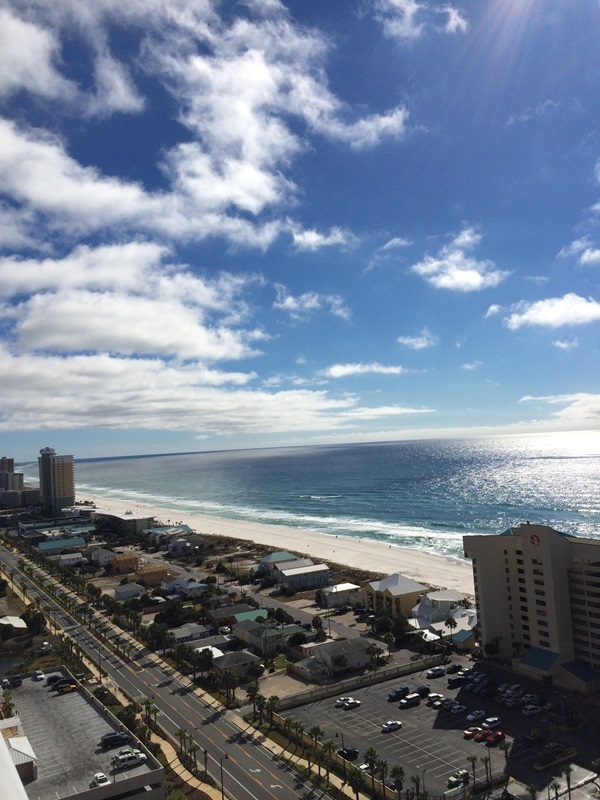 Recently, Dave and I were excited to be given the opportunity to go on a press trip to Panama City Beach, Florida. It was an amazing trip where we had the chance to learn about all the family friendly options the area has to offer including the city’s fun New Year’s Eve celebration where 10,000 beach balls dropped on top of a crowd filled with wide-eyed and excited children. It was amazing! Keep an eye out for posts covering this event as well as other area attractions. 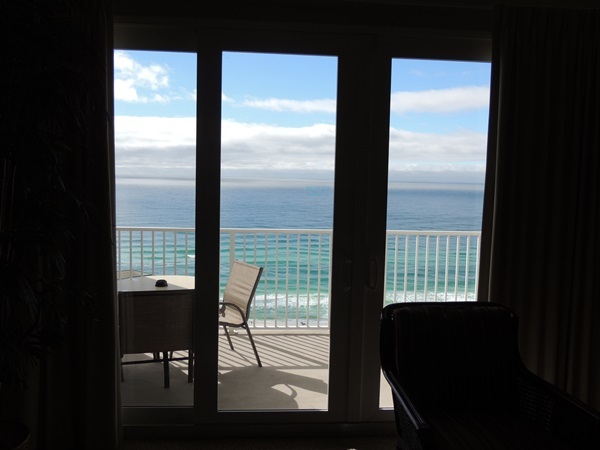 While in Panama City Beach, accommodations were provided by Laketown Wharf Resort. As soon as we opened the door to our two bedroom condo we were in awe of the spaciousness, the impressive amenities, the luxurious decor, and the dazzling view. I honestly can’t say enough about how much we adored the large balcony and gorgeous views of the Gulf. Even though it was unusually chilly during our trip due to the impending Polar Vortex crossing the country, we sat out on the balcony as often as possible. Not only did we enjoy the view but we liked it’s size. If Kora & Logan had come with us there would have been plenty of room for all of us plus extra to spare. I also liked that there were doors for the balcony both off the living room and master bedroom. We loved the Master Bedroom & it’s view from bed as well. 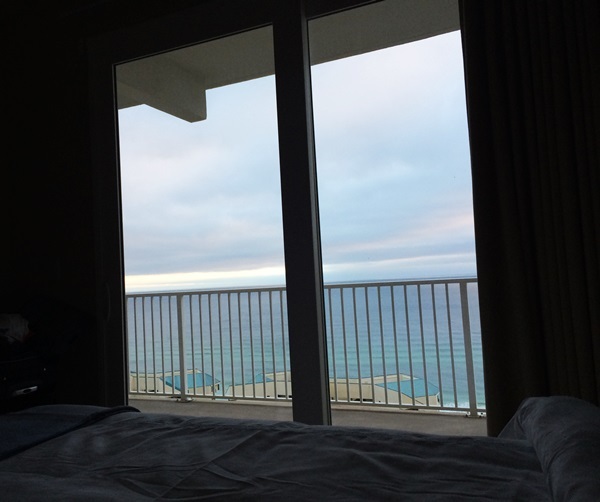 It was amazing to wake up every morning, pull back the curtain, and look out at the water, sky, and clouds. It was memorable and the beauty made us feel like we had truly escaped from the every day. Here’s a look at some of our other favorite features: a full size elegant kitchen, large living room with plenty of seating, good size second bedroom, fun kids bunk beds, lovely master bath with whirlpool tub, 2nd bath, washer & dryer, and even cute towel animals and paper flowers. 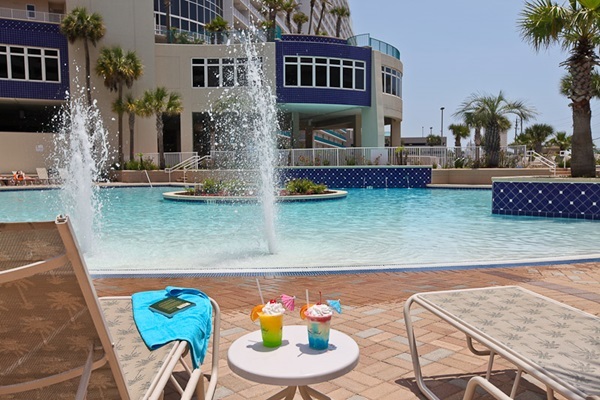 We were excited to see that Laketown Wharf Resort also has 5 pools including a zero entry pool, a kid’s pool, a secluded island pool, and a 10th floor rooftop pool. There’s also a putting green, a 52,000 square foot lakefront boardwalk, a fitness center, covered parking, and a children’s playground. There’s even a nightly water and fountain show designed by the same person who designed the water show for the Bellagio in Las Vegas. You can see a preview of the show on the resort website, it’s really impressive! 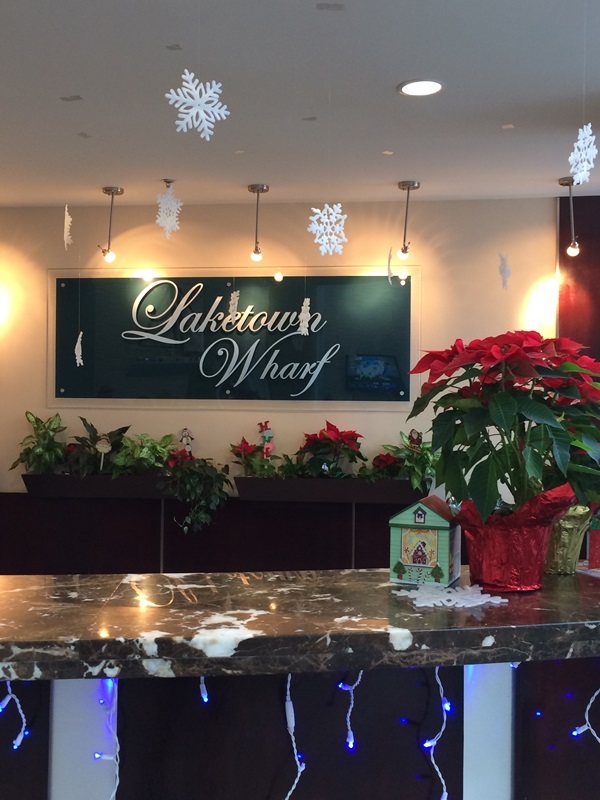 We highly recommend Laketown Wharf Resort. It’s location is fantastic, the condos are beautiful, spacious, and offer incredible views, and the prices are reasonable. We could have easily brought along Kora & Logan as well as my parents to stay at the resort and we still would have had plenty of room. The resort is dog friendly too, so Yoshi could have come along as well! 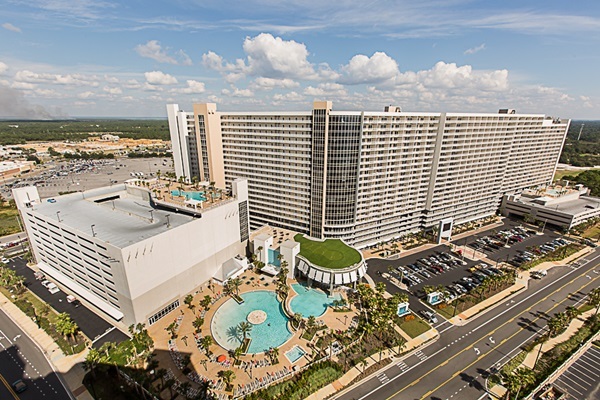 We are so excited about our stay there that we are already in talks with my parents to plan a trip so we can show them and the kids the resort as well as everything Panama City Beach has for families. 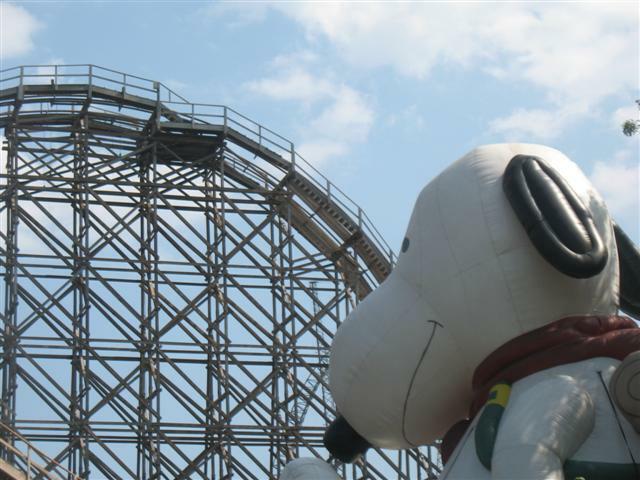 On that note, stay tuned for my upcoming series of posts covering our favorite area attractions and activities for families. 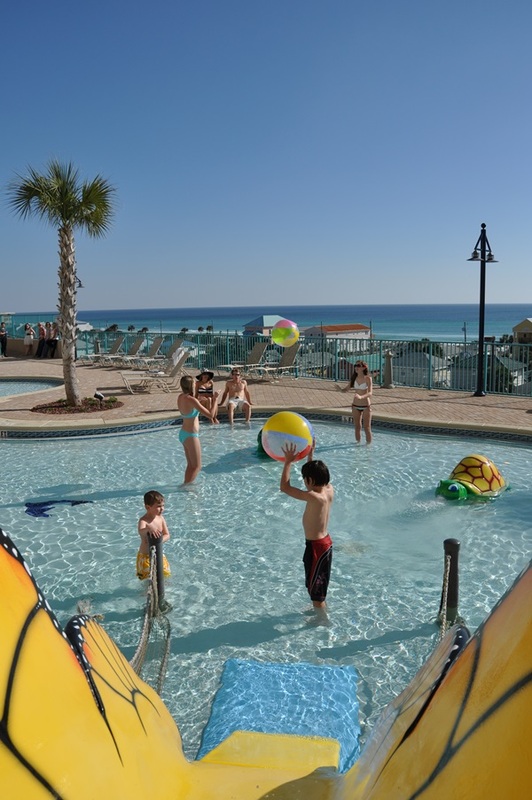 With more than 27 miles of beaches and an average of 320 days of sunshine annually, there really is something for everyone in Panama City Beach, Florida. Press trip provided. The honest opinions are my own. 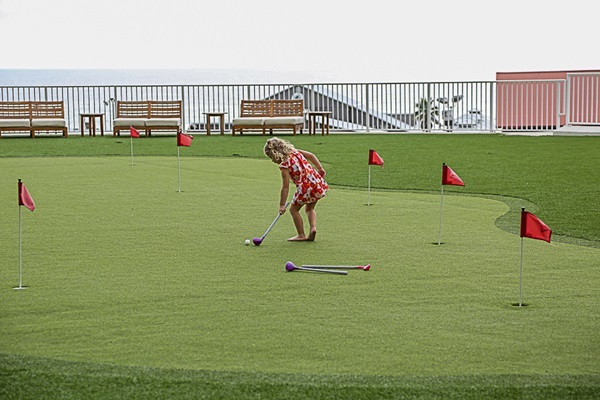 Photo credits for hotel aerial shot, pool photos, & putting green photo: Laketown Wharf Resort. I want to go where there is ocean. I’m 1000 miles from the west coast & 2000 from the east. Beautiful Photos! Looks Like A Great Resort With Lot’s Of Activities. That is one gorgeous view! I would love to wake up to that in the morning. The entire resort looks perfect for a family vacation. Wow! What a fantastic trip! I enjoyed viewing all the activities. I particularly enjoyed the views inside the condo. The balcony, the living room and the kitchen were wonderful. 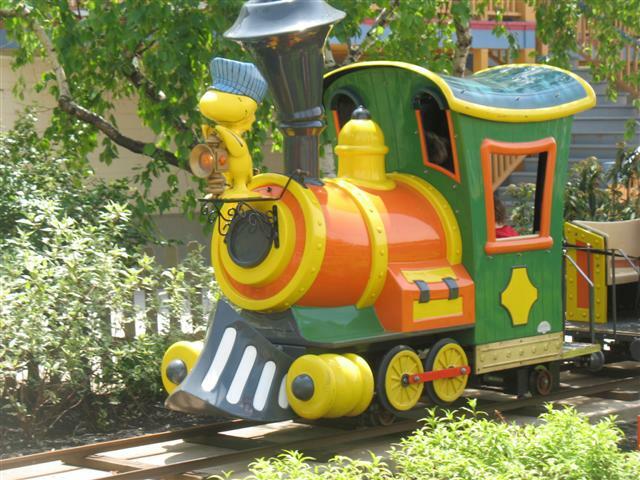 look slike fun- thanks for the great review! Great looking place. We drive from Tampa to Biloxi at least once a year, but that drive is now just too long for one day. We’re going to start looking for a nice mid-point like this to slow our roll, literally! i love the view and all the activities you can do. we stayed in a different hotel when we went there. This looks like a nice place to be with the family. Wow this place looks fantastic!! We have always wanted to check out Panama City Beach, glad to know it has some family friendly stuff. What a pretty place! The window view is magnificent. 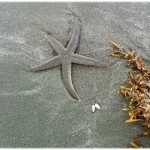 As a native of this area, I can vouch for it’s beautiful beaches & fun atmosphere. This looks like a great place for a family to visit. It doesn’t look as crowed as some resorts I have seen in Florida. Plus the room looks way bigger then most condos. This would be great for a family getaway. Thanks for the great pictures. They are beautiful and the sites are amazing. I would have liked to see those beach balls too! Everything looked fabulous. I bet you did have a great time. Everyone I know says that Panama City is only for spring breakers. Thanks for presenting a different side. What a beautiful resort. I loved your room and what a fantastic view. I could just live there year round. Wow, what a nice place, and what a beautiful view from the hotel room. Thanks for the info! I love Panama City, and am always looking for a new place to stay. Thanks for the info!!! wow! amazing views, breathtakingly beautiful. i would definitely enjoy this hotel/vacay with the family! That resort looks pretty incredible. I love the spaciousness of it and the pool looks so inviting as does the view. Having a washer/dryer on hand must have been nice too. 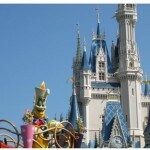 Hopefully my hubby and I can stay there next time we are in Florida. absolutely beautiful. What a great family place to vacation. I haven’t been to Panama City Beach in ages! The new addition of this amazing Laketown Wharf Resort though would definitely make me want to go again. The Resort would enable me to have a great getaway anytime of the year and especially in Summer without having to fight the crowd on the beaches! Thanks for a wonderful and honest review! What a great view from the master bedroom! I would love to visit Panama City Beach and just relax and play in the water. Oh that view! I so want to visit Florida one day! I absolutely love the pool area. I have never visited Panama City Beach before. 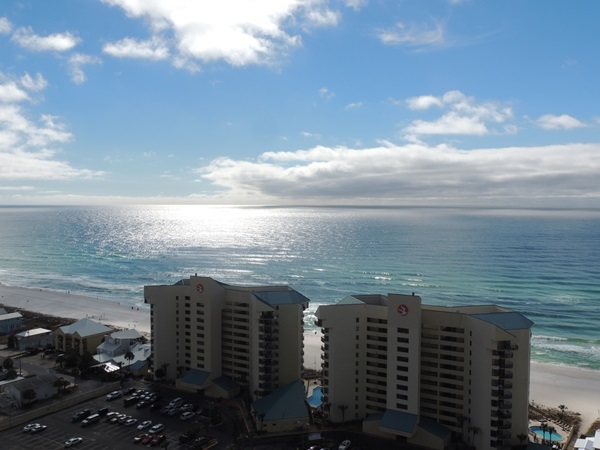 Panama City Beach, Florida is pretty place to visit any time of the year. Love it. I love the stuff they make out of the towel all the time, so creative and cool. I cant wait for our family vavcation in a few months, awesome pictures here! What a gorgeous view! It looks like a beautiful place to visit. Gorgeous! The views, decorations and accomodations are spectacular! I would love to see the water show…I find them amazing and I’ve always wanted to go to Florida! This place is gorgeous! I would love to stay in Panama City when I go to Florida. The beach is right there, and the pool looks like fun. Your room is very pretty! I have never been there before , but it looks like a wonderful place to visit for the summer. What a beautiful view. I so wish I was there right now! This looks like a wonderful resort. There are so many things to do and enjoy! Looks like a great place to vacation! Would love to pack my bags and go today! 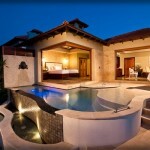 Looks like an awesome place to vacation, love the pool– omg.. Wish I was there now! Oh my gosh, that view is beautiful. What a great vacation spot.